Designed to minimize costly water loss, the WaterWI$E Fill Valve is the only dual shut-off fill valve that detects flapper leaks and hang-ups. Saves water due to leaks by not refilling the tank during a slow flapper leak and automatically shuts off if flapper is stuck open. 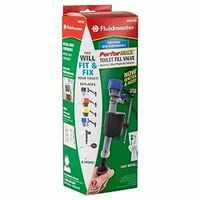 Designed to fit more toilets, this toilet fill valve adjusts from 7-3/4" to 13-1/2", fitting large and small tanks. The WaterWI$E Fill Valve is quieter than other fill valves. Included in the kit is the Korky Plus 2 in. toilet tank flapper. The universal flapper is constructed from durable rubber and offers chlorine resistance. Easy to install, the 818Z includes: (1) 528Z Fill Valve, (1) 2001 Flapper, (1) Refill Tube, (1) Metal Refill Tube Clip, (1) Mounting Nut, (1) Cone Washer, (1) Coupling Nut, (1) Tamper Proof Key and (1) Instructions.